Welcome to Occitania. 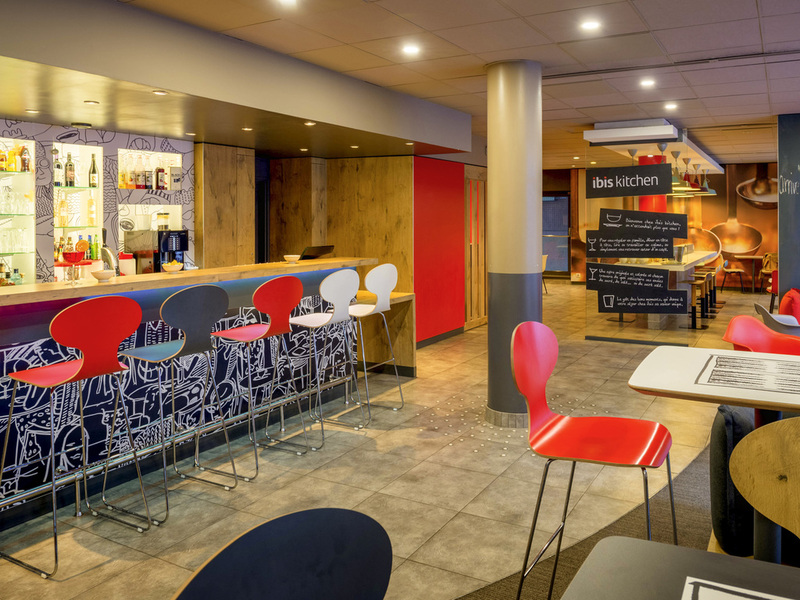 The entire team at the ibis Toulouse Centre hotel welcomes you to "la ville rose." Discover the riches of Toulouse: the Capitole, Basilica of Saint-Sernin, the Garonne, Cité de l'Espace, Airbus, and many other places! See you soon! In the heart of Toulouse and a 10-minute walk from the historical center, the ibis Toulouse Centre hotel is perfect for your business or leisure stays. Take advantage of our comfortable, quiet, air-conditioned rooms and free WIFI throughout the hotel. A 1 0-minute walk from Toulouse Matabiau train station, 164 yards (150 m) from the airport shuttle bus stop and 219 yards (200 m) from Jeanne d'Arc metro station. You can park your vehicle at the nearby Jeanne d'Arc public car park at reduced rates. Situated in the heart of the historic and commercial heritage of Toulouse. Welcoming, modern and comfortable, with a cozy bed and functional bathroom. The ibis room has everything you need to enjoy your stay. Open every evening from Sunday to Thursday, our ibis Kitchen restaurant offers simple, contemporary cuisine in a warm and modern environment. The stylish and warm bar area is open every day at any time. There you can enjoy your favorite drinks and our tasty snacks. Convenient, comfortable with friendly staff and great location. Staff were very helpful and we had no fuss in checking in or out. The location is excellent and the ambience very welcoming. The room was clean, modern and the bed very comfortable. I was from Mon to Fri on business trip in TLS. This happens quite often along the year and I always stay at Ibis Center. This hotel is my home in TLS. It has a perfect location and all you need when travelling for work. Experience was very good. Staff very kind, some of then even speaking Spanish. room and bathroom a bit small, bed really good. The location and breakfast are good. Nevertheless, the room is too small and smells a cigarette. Besides, there is no hot water in the shower. We had a cold shower. Staff very kind. Breakfast very good. Rooms small. Friendly staff and very polite service. Rooms always clean and tidy. Very clean and hygienic reception area and restaurant. Everyone helpful in anyway they could. An all round enjoyable stay again at the Ibis. Small but quiet room. Decor a bit dated in the corridors. Breakfast had a decent selection. Hotel very well located. Ibis Toulouse Centre is conveniently located 5-10 min stroll from the city center and 10 min walk from the train station. It is a welcoming place to explore the city of Toulouse from. The room was clean and consistent of the Ibis standard. Very good; clean; good breakfast! There were everything which one expected from a good Ibis. Helpful staffs, well working free wifi, a proper desk, power points at useful positions. The room was not very big but enough for 1 person and it was clean and easy to use. I chose Ibis this time rather than other hotels for 12.00 check-in time (as my train arrive rather early), this hotel is very close to metro station of Jeanne D'arc and shops of city center, and walkable from the train station (10min) so the location is good, and the price was reasonable. It is a very business traveler friendly hotel(they have neally all service business traveler need). For this I feel safe to stay in Ibis when I was on demanding business trip. This time everything was working well, and I didn't find anything to complain. Hotel is well located and the staff were friendly and welcoming. Shower is small but manageable, breakfast was fine and overall a good experience. completely excellent, from the booking to checking in, cleanliness of the room. the breakfast was particularly enjoyable and your American colleague looked after us brilliantly , well done! Totally great from beginning to end. We were also pleased that the hotel was truely in the centre of town! The gilets jounes added to our experience of how our French neighbours appeal to their Government. Arrived late and expected restaurant to be open, but it was closed. My request to print airline boarding pass was handled efficiently by your receptionist.